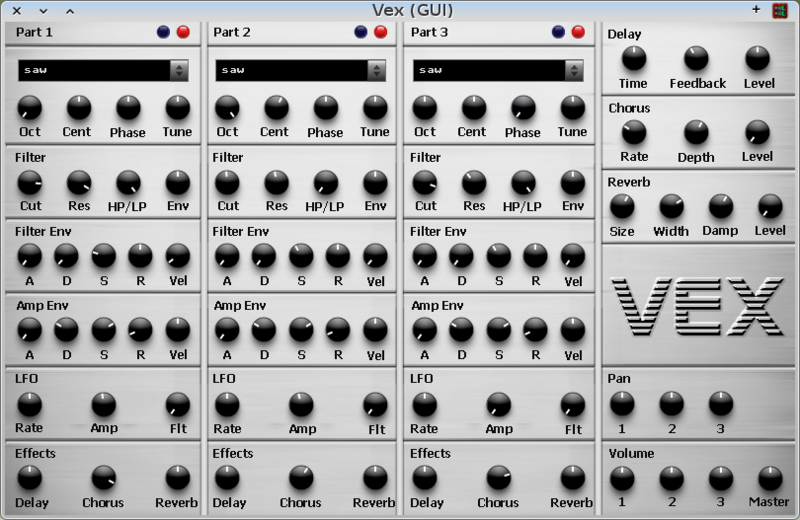 Another interesting softsynth for the GNU/linux platform created by Rock Hardbuns is Vex, a 3-oscillator wavesample/subtractive synthesizer that provides a nice variety of waves for intial tones. It can be run standalone through jalv.gtk or a plug-in manager like Carla. Each of the 3 oscillators is completely autonomous (the red button activates the respective oscillator). Each oscillator has its own octave/fine detuning, phase adjustment, filter section with traditional ADSR layout, low-pass-to-high-pass filter capability, amplitude ADSR envelope, LFO sections, effects channeling controls. Chorus, reverb and delay are included in the effects section, as well as individual amplitude level and panning controls. Each oscillator also has a 16-step arpeggiator. The arpeggiator windows are displayed by clicking the blue button located next to the respective oscillator. The arpeggiators have various control settings as well, such as speed and key-sync. VexPatches-01 A few presets for Vex. Extract this tarball into your hidden .lv2 directory. VexPatches-02 A second bank, some with arpeggiator. These all include the Vex prefix, for easier selection.